Scientists have created the coolest way to use lasers we’ve seen in a while. 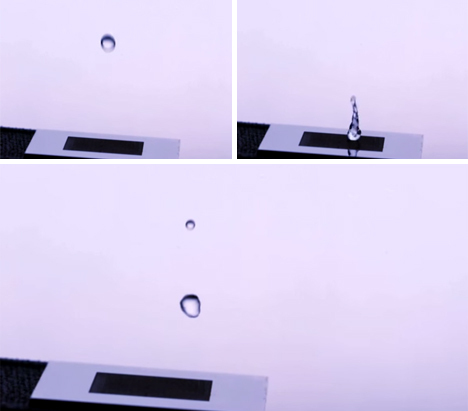 A team at University of Rochester’s Institute of Optics made a superhydrophobic surface that causes water to bounce right off of it like a SuperBall hitting the floor. The team behind the etched metal was inspired by nature’s many hydrophobic, self-cleaning surfaces. They use the example of the lotus leaf: it is extremely hydrophobic and uses this quality to keep its surface clean of dirt and debris. Studying the lotus leaf up close yielded the discovery that the lotus leaf surface is covered in a hierarchal structure of patterns on the micro and nano scales. 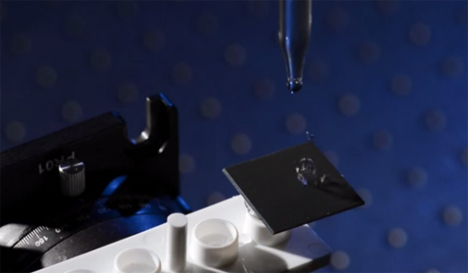 They recreated the same type of structure in their multi-functional hydrophobic surfaces to induce the crazy water-bouncing effect seen in their videos. Possible uses for the new superhydrophobic surface are widely varied and completely awesome: waterless toilets, ice-proof airplane wings, smoother flowing air conditioning pipes, anti-microbial coatings, and effective rust-proofing. See more in New Materials or under Science. February, 2015.